Lincoln School was built in 1931. The building cannot meet the demands of a full 2002 education in a healthy and secure environment. Lincoln School has inadequate teaching area, insulation, ventilation, lighting, electrical wiring, data and video cables, security, fire safety, disabled accessibility, class space, storage space, classroom facilities, etc. The limitations of the building are best and most economically remedied by building replacement. Lincoln School was built 71 years ago, when Tin Lizzies still roamed most of the country. Like those venerable jalopies, it had its place. In the 21st Century, Lincoln School, like the Tin Lizzie, is obsolete. The building cannot meet the requirements of a 21st century comprehensive education curricula. Without major renovation, it is totally unsuitable for modern information technology, such as computer, interactive tv., security, environmental control, etc. that are required in today's schools. The school cannot meet current fire, health, safety, disability and building codes and regulations, without exorbitant cost. It was built when energy and labor were cheap, and the demands of a "modern" education were far less than today. The children of Schoolcraft County deserve better. The following photographs and text detail some obvious, visible problems. 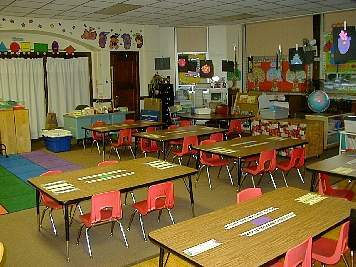 Photographs of the classrooms provide a general understanding of the limited facilities available. 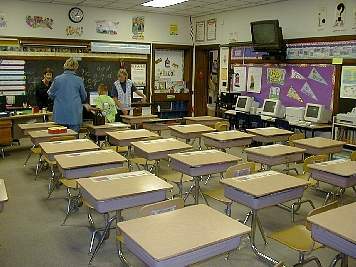 Technology cannot be deployed in a manner appropriate for a 2000's education because there is insufficient room, insufficient ventilation, insufficient electrical power capacity, insufficient data capacity, etc., that are prohibitively costly to retro fit a massive depression era building. 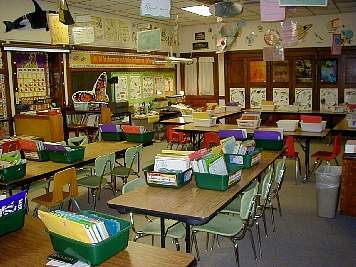 The general appearance of the classrooms and facilities is, at best, more in line with the 1950's than the 2002's. If the voters pay attention to current television news and documentary scenes of middle school classes, they might note considerable differences between what is, in Manistique, and what is, most everywhere else, in the U.S.A. Those differences effect the quality of your children's or grandchildren's education. Superintendent of schools, Ken Groh, architect Don Morgridge and several members of M.A.S. 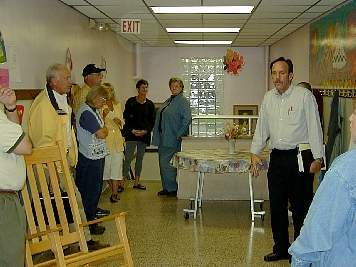 administration and faculty give a few members of the public a tour of the school. Apparently, much of the community was aware of the details, or didn't care to know. 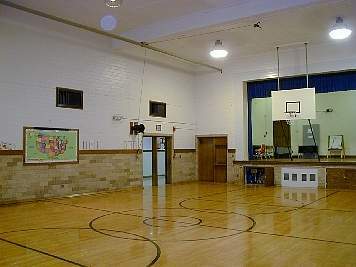 A small multipurpose physical education facility with no permanent seating, no room for game spectators, terrible acoustical properties, and numerous features considered safety hazards, now, but not when it was built. As a full purpose gym, a desirable stage facility or as an auditorium, it is a failure of compromise. A consolidated middle school will provide appropriate facilities for all children. 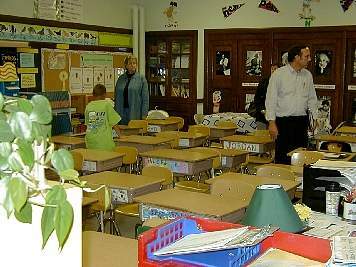 The original teacher's lounge converted to a classroom. It works, to a degree. Cramped, small classrooms, with poor lighting, poor ventilation, and poor teaching facilities	more consistent with 1930's standards. It must be a chore, for many kids, to stay alert and study effectively. What is the future price? Like all the other middle schools, there are no lockers so there is no way to secure student property. Contact between clothes and property foster the spread of communicable diseases and parasites. The collector's item doors, and fire alarm horn, in the top right corner, should bring a tear of nostalgia to great granpa's eye. 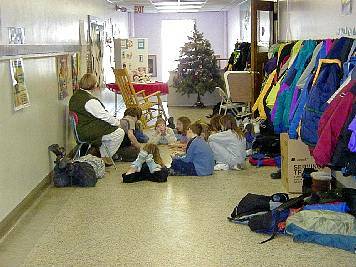 A math class held on the hallway floor. No facilities? Use the floor. Its better than nothing. 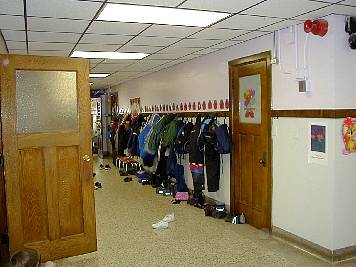 For obvious evacuation safety reasons, the hallway cannot be cluttered with furniture and teaching paraphernalia.